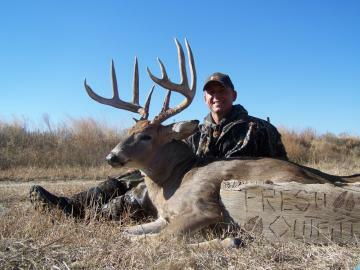 This is the Hunting Photo Gallery for past and present hunts with Fresh Track Outfitting. Starting this year we are separating the years out and you will be able to see some of the different Deer and Turkey taken during hunts. Any photos taken before the 2008 Season will be shown in the Past Hunting Gallery . This gallery will be updated through out the different hunting seasons for Deer and Turkey with new photos whenever they become available. If you would like us to use any of the photos you have taken over the years hunting with Fresh Track Outfitting, feel free to email them to info@jtddesign.com and we will check them and approve them for upload to the website. The season never ends for the Fresh Track crew. Take a look at some of the stuff they found during spring scouting.